Earliest paper was made in China around 200 BC from a mass of entangled silk. Later (AD 105) it was produced using mulberry and other bast fibres, old rags, and hemp waste. The art of paper making was introduced in Japan in 610 AD, and into Central Asia about 750 AD. The first paper In Baghdad was made during 793, the golden age of Islamic culture,. Earliest paper in Europe was made in Spain, around 1036 AD., from linen and cotton rags. . By 14th C Several paper factories came up in Spain, Italy, France, and Germany. The demand for paper increased with the introduction of printing. Till 18th C each region relied on local raw materials and so produced paper of local quality and style . By 19th C many pulping processes were innovated to overcome shortage of raw materials. The pulping processes related to separating fibres from wood by mechanical as well as chemical means. 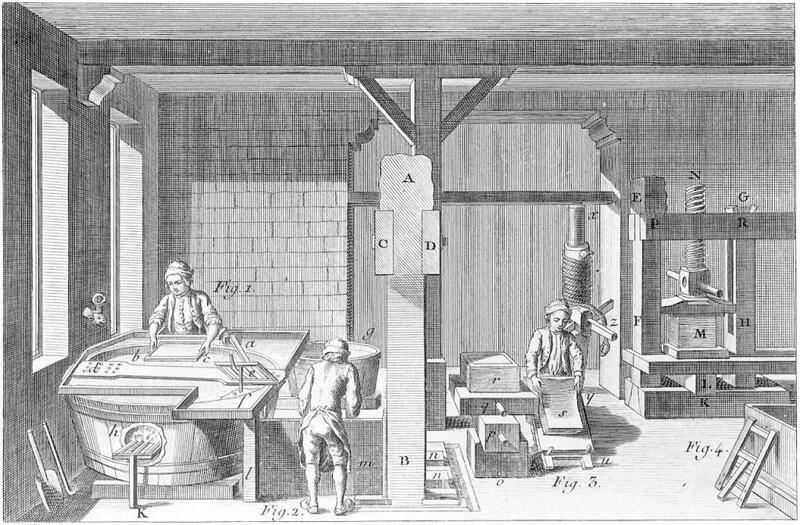 Nicolas-Louis Robert (1798) of France created first practical machines for paper manufacturing. Machine By 1875 papers created by machinery formed papers were used for new photoengraving process for printing halftones. Fourdrinier machines, (1884) produced long rolls of paper dried by suction, pressure, and heat. Pulp production by grinding wood, and chemical pulp processes offered cheaper raw materials. Earlier paper sheets were sized by a tedious impregnation process using animal glue or vegetable gums. But by 1800, paper sheets were sized with rosin and alum and bleached with chlorine. Paper is mainly made from cellulosic fibres, derived from plant sources. The cell walls of all plants contain fibres of cellulose. It constitutes about one-third of the structural material of annual plants and about one-half that of perennial plants. The fibres depending on their origin have different types of cell structures and so provide unique character to the paper. Paper of some sort can be produced from almost natural plant, but qualitative requirements and economics of manufacturing, limit the sources of supply. 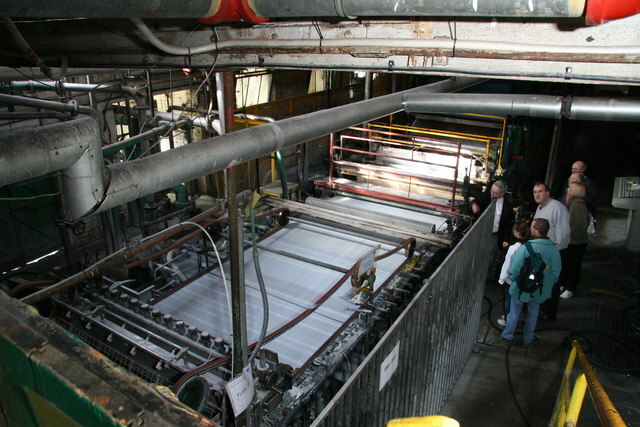 Cellulose for paper manufacturing is derived from many sources. Cellulose fibres have high strength and durability. They are readily wetted by water, exhibiting considerable swelling when saturated, and are hygroscopic. Even in the wet state, natural cellulose fibres show no loss in strength. Most plant materials also contain non-fibrous elements or cells. The non-fibrous cells are less desirable for the paper-making, than fibres, but mixed with fibre, are of some value such as the filling material in the paper sheet. It is the combination of these qualities with strength and flexibility that makes cellulose of unique value for paper manufacturing. Fibre sources: Major sources of cellulose for paper manufacturing is wood. Cotton is the next important source of cellulose for paper making. Cotton fibres are used in the form of lints (seed hair left behind after ginning), staples, waste yarn and threads and rags. Lints require no processing, staples need length shortening, but yarns, threads and rags need undoing of all mechanical processes such as spinning and weaving. Cotton fibres are used where maximum strength, durability, and permanence, as well as fine formation, colour, texture, and feel, are required. These properties are attributed to the greater fineness, length, and purity of rag fibre as compared with most wood pulp. Rag papers are used extensively for bank note and security certificates, life insurance policies and legal documents, for which permanence is of prime importance, technical papers, such as tracing paper, vellums, and reproduction papers, high-grade bond letterheads, which must be impressive in appearance and texture, lightweight specialities such as cigarette, carbon, and Bible papers, and high-grade stationery, in which beauty, softness, and fine texture are desired. Khadi paper is an example of high rag content paper. Linen, Jute, Hemp, various type of grass, bamboo, cane (rattan), paddy (rice) straw, banana leaf, sugar cane waste (bagasse), are some of the other sources for cellulose. The cut and cleaned rags are cooked (to remove natural waxes, fillers, oils, and grease) in large cylindrical or spherical boilers. About three parts of cooking liquor, a dilute alkaline solution of lime and soda ash or caustic soda combined with wetting agents or detergents, is used with each part of rags. Steam is admitted to the boiler under pressure, and the contents are cooked for three to ten hours. Once cooked, the rags are washed, then mechanically beaten. The beating shortens the fibre, increases the swelling action of water to produce a softened and plastic fibre, and fibrillates or frays the fibre to increase its surface area. All of these actions contribute to better formation of the paper sheet, closer contact and inter-fibre bonding that gives the paper strength and coherence. Waste-paper is a major source for cellulose. By recycling the waste-paper the dependency for virgin fibre is reduced and the problem of solid waste disposal is minimized. However, the difficulties like, gathering waste-paper from scattered sources, sorting mixed papers, and recovering the fibre from many types of coated and treated papers, make it a very complex problem. Paper treatments such as asphalt, synthetic adhesives, metal foils, plastic and cellulose-derivative films and coatings, printing inks, etc. pose acute problems in reuse of paper wastes. Waste-paper is of four main categories: High-grade, old corrugated boxes, printed news papers, and mixed paper. High-grades and corrugated stocks originate mainly in mercantile and industrial establishments. White paper wastes accumulate in paper conversion units and printing plants. Magazine stock comes from news-stand returns, but some comes from homes. Mixed papers come from collectors. There are two distinct types of paper recovery systems: 1. recovery based upon de-inking and intended for printing-grade or other white papers, and 2. recovery without de-inking, intended for box-boards and coarse papers. Caustic soda, soda ash, silicate of soda, phosphates, and surfactant are used to remove the inks. Natural fibres other than wood: Alternative sources for paper pulp have been in use even before wood pulp was available. Cereal straws, plant stems, paddy husk, grasses like esparto, bagasses (sugar cane), etc. are used in many parts of the world, that are deficient in forests and where such products are abundantly available. Non-woody plant stems differ from wood, as these contain less total cellulose, less lignin, and more of other materials. Papers made from these pulps without an admixture of other fibre tend to be dense and stiff, with low tear resistance and low opacity. Flax, Hemp, Jute. Kenaf have been highly prized because of the strength and durability it imparts to such products as tags, abrasive paper (sandpaper), cover stock, and other heavy-duty paper. It is also used for duplicating and manifold paper, in which extremely light weight paper must have exceptional strength. Flax is grown expressly for high-grade cigarette paper. Synthetic fibres: Synthetic or man-made fibres provide certain advantage when compared to plant based materials for paper pulp. Natural cellulose fibres vary considerably in size and shape, whereas synthetic fibres can be made uniform and of selected length and diameter. Long fibres, for example, are necessary in producing strong, durable papers. There are limitations, however, to the length of synthetic fibres that may be formed from suspension in water because of their tendency to tangle and to rope together. Even so, papers have been made experimentally with fibres several times longer than those typical of wood pulp, these papers have improved strength and softness properties. Natural cellulose fibres have limited resistance to chemical attack and exposure to heat. For such purposes synthetic fibre papers can be made resistant to strong acids, for example in chemical filtration. Paper can even be made from glass fibre, and such paper has great resistance to both the heat and chemicals. Natural fibres swell when beaten in water and cement together as they dry, synthetic fibres must be bonded by the addition of an adhesive, requiring an additional manufacturing step. Synthetic fibres are not affected by changes in moisture and produce dimensional ly stable papers. Synthetic fibre felts (non-woven) are very similar to paper in construction. Yarn staples, carding waste, and filament cuts often re-carded, i.e., separated, combed and pressed to form a uniform, lightweight, and fragile web. This web, felt or the non woven-blankets if assimilated with heat or adhesive, a product similar to paper results. Pulp is produced by both mechanical and chemical (alkali & acid type) processes. Wood is debarked cut into pieces, pulverized and pulped with water as the main suspending agent. A mechanical pulp sometimes contains several impurities like lignin, woody matter etc. Mechanical processes reduce the fiber length due to heavy handling of the mass. On the other hand chemical processes being less severe, do not reduce the fiber length. Removal of impurities’ is very good. However, adjustment of PH level is sometimes a problem. Chemical pulps are sometimes called wood free pulps, because there is a substantial removal of lignin and other woody matter. During pulping the mass is cleaned and bleached. Mechanical or ground-wood pulp is made by subjecting wood to an abrading action, either by pressing the wood against revolving grinding stones or by passing the chips through a mill. The pulp stock flows from the grinder to a series of riffles and screens, which separate the heavy foreign material and pieces of non- fiber wood (shives), knots, bark, and the like. The wood fibres are separated. In ground wood pulp, the fibres are fragmented, and there is considerable debris (fines). Ground wood pulps contain all the chemical constituents of wood, including lignin, hemi-cellulose, resin, and various colouring materials. This debris on exposure to light and heat and after ageing, cause discolouration (yellowing) of paper. Ground wood pulps are not very white, so are often bleached with peroxide or hydro sulphite to improve the whiteness, yet it does not equal to whiteness of pure cellulose. Ground wood pulp fibres are relatively short and have only a moderate ability to bond each other, so papers made from such raw materials have low strength. However, papers containing ground wood have good opacity, high bulk and good printing qualities. Chemical wood pulp is made by cooking wood chips with chemical solutions in digester operated at elevated temperature and pressure. The chemicals used for two prime purposes 1. To make the lignin of wood soluble, and 2 for purification and bleaching. Paper produced by the kraft process is particularly strong and durable. Chemical wood pulp that is purified both by bleaching and by alkaline extraction is called an alpha or dissolving pulp, and is used for speciality papers. Semi chemical pulp is made by treating wood chips with sulphite or alkali in amounts and under conditions that soften the lignin, but dissolve only part of it. The softened chips are then de-fibred. The chips are steeped and impregnated with inorganic chemical solutions similar to those used for full chemical pulping, but in smaller amounts and with less severe condition. The high fiber yield pulps are usually termed chem-mechanical pulps. The semi chemical-pulps have chemical and strength properties intermediate between softwood, ground wood, and full chemical pulps. These are used in a wide range of papers and boards. The major tonnage of semi chemical pulps goes into the light board (termed corrugating medium), which is fluted to serve as the interior layer of corrugated box board in heavy-duty containers. Stiffness and adequate strength are the important properties. Semi chemical pulp is used in many low-cost printing papers. Various agents are added to paper pulp to enhance or to modify the bonding and coherence between fibres. To increase the dry strength of paper, the materials most commonly used are starch, poly acrylamide resins, and natural gums such as locust bean gum and guar gum.